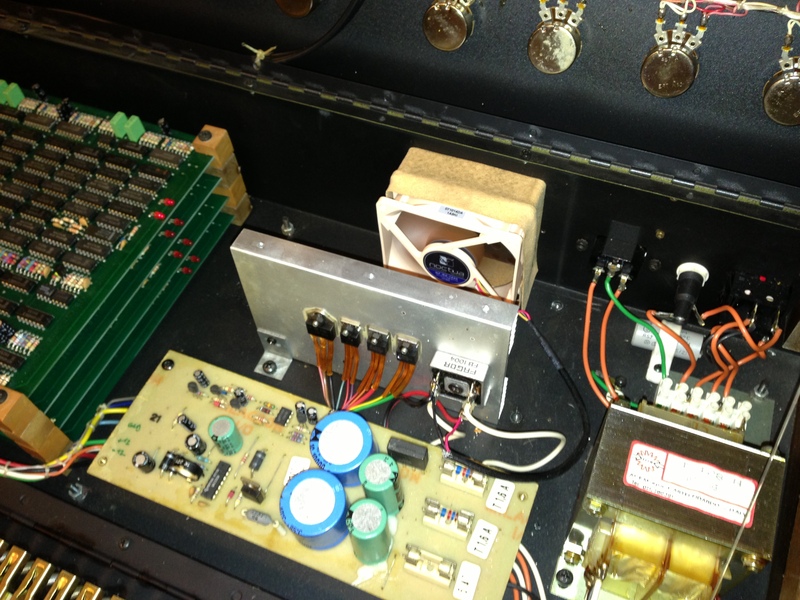 The Elka Synthex is using a cooling fan in order to keep the power supply temperature low. It is really noisy which can be quite annoying if used in a silent environment. For this reason I decided to replace the original fan by a low noise variant with the same size. The original fan is running on the mains supply (240V), the one used for replacement, a Noctua, is specified for 12V. I found that I could get a decent airflow and an even lesser noise level running the fan at 9V DC, which was almost perfect since the power supply of the Synthex provides 8.8V at the output of the DC rectifier RT1 where I connected it.